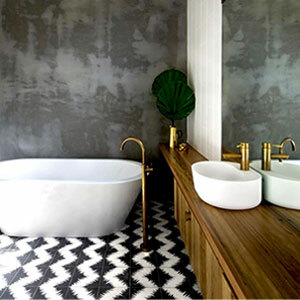 Tiles: For a nonslip floor, many people go for small tiles with lots of grout lines, which offer better grip than large tiles. Another option, however, is tiles with textured surfaces, matte finishes, or sand-containing glazes. Try to avoid porous natural stone tiles like limestone and choose porcelain or glazed tiles if you want a low maintenance floor. To keep longevity in mind, ensure they are well sealed or they’ll absorb water and become stained over long periods of time. Thinking of renovating your bathroom?